Heat gas or charcoal grill. When grill is heated, place chicken breast halves and bell pepper pieces on gas grill over medium heat or on charcoal grill 4 to 6 inches from medium coals. Cover grill; cook bell pepper 10 to 15 minutes or until tender, turning once; cook chicken 12 to 15 minutes or until fork-tender and juices run clear, turning once and brushing frequently with half of the salad dressing. During last 6 minutes of cooking time, place garlic toast on grill; cook 4 to 6 minutes or until light golden brown, turning and rearranging several times. 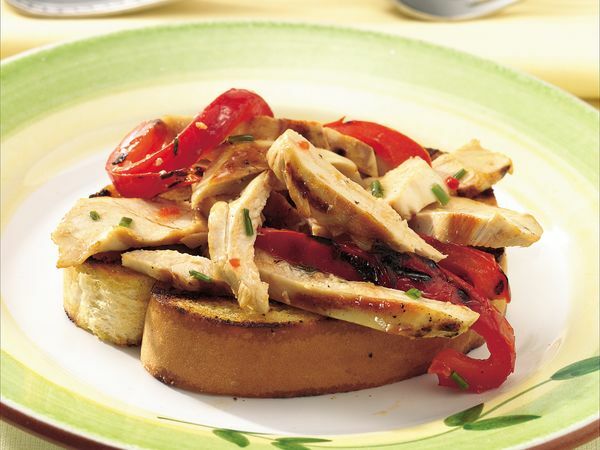 Cut chicken and bell pepper into thin strips; place in medium bowl. Add chives and remaining salad dressing; stir gently to coat. Divide chicken mixture evenly onto garlic toast. Serve with knife and fork. Frozen Texas cheesy toast can be substituted for the regular Texas garlic toast. Yellow or green bell pepper can be substituted for the red. To broil chicken and bell pepper, place on broiler pan; broil 4 to 6 inches from heat using times in recipe as a guide, turning once and brushing chicken frequently with half of the salad dressing. During last 6 minutes of cooking time, place garlic toast on broiler pan; cook 4 to 6 minutes, turning and rearranging several times.